Koji su sve janjinari, kada i kako pošli u Ameriku? Postoji dokumentacija brodskih lista (manifesta) putnika koji su ušli u Sjevernu Ameriku preko Ellis Island (mali otocic ispred New York-a koji je sluzio za administraciju, registraciju i karantenu useljenika iz Evrope krajem devetnaestog i početkom dvadesetog stoljeća). Malo sam preteaživao, našao 100 janjinara (sigurno ih je puno više) i evo rezultata. Trebalo bi sustavnije pretražiti. Kod zapisivanja mjesta i imena putnika ima puno "slobodne transkripcije", pa je tako "Janjina" i Jagnino, Janfine, Janginer, Janina, Janyna, Yaguina, Jaguina, Jorima, Janjna, Janinia, Tanjne, Yonjrna, Inginna, Tanica... i ko zna kako još, a i prezimena su "krivo" upisivana (tako sam ih i ostavio). Često su naši stari putovali grupno pa su i u brodskim popisima zajedno, što olakšava pretraživanje. Klikom na "Prezime, Ime" dobit će te originalni brodski popis putnika (manifest). Ovdje je samo dio manifesta, ima puno toga pa tko želi više može pogledati izvorni "site". Built by Harland & Wolff Limited, Belfast, Northern Ireland, 1897. 8,173 gross tons; 469 (bp) feet long; 53 feet wide. Steam triple expansion engines, twin screw. Service speed 15 knots. 2,350 passengers (200 first class, 150 second class, 2,000 third class). Built for Holland - America Line, Dutch flag, in 1897 and named Rotterdam. Rotterdam-New York service. Sold to Scandinavian American Line, in 1906 and renamed C.F. Tietgen. Copenhagen-New York service. Transferred to Russian American Line, in 1913 and renamed Dwinsk. Libau-New York and later Archangel-New York service. Transferred to Cunard Line, British flag, in 1917. Transferred to the British Government. Torpedoed and sunk by a German submarine off Bermuda in 1918. Built by Chantiers de Penhoet, St. Nazaire, France, 1891. 9,047 gross tons; 520 (bp) feet long; 56 feet wide. Steam triple expansion engines, twin screw. Service speed 19 knots. 1,090 passengers (392 first class, 98 second class, 600 third class).Two funnels and three masts, in 1902 masts reduced to two. 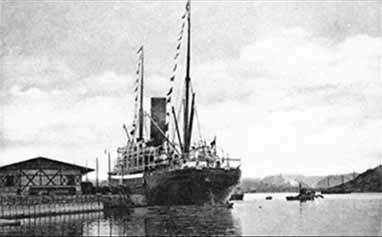 Built for French Line, French flag, in 1891 and named La Touraine. Le Havre-New York service. 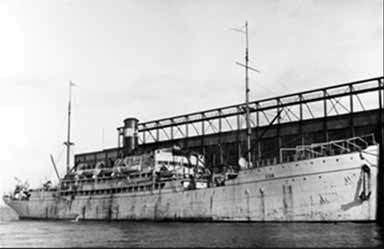 Used as a floating hotel at Gothenburg, Sweden in 1923. Renamed Maritime in 1923. Scrapped in France in 1923. Built by Swan, Hunter & Wigham Richardson Limited, Newcastle, England, 1903. 13,603 gross tons; 558 (bp) feet long; 64 feet wide. Steam quadruple expansion engines, twin screw. Service speed 14 knots. 1,704 passengers (204 first class, 1,500 third class).One funnel, four masts, steel hull, three decks. 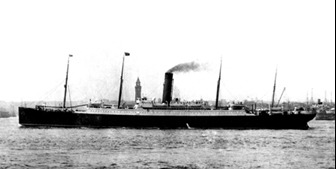 Built for Cunard Line, British flag, in 1903 and named Carpathia. Liverpool-New York and Trieste-New York service. 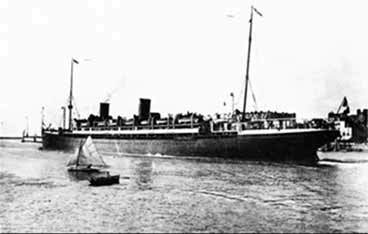 Rescued 705 survivors on April 15, 1912 from the sunken TITANIC. Torpedoed and sunk by a German submarine off the English coast in 1918. Built by Russell & Co, Port Glasgow, Scotland, 1907. 6,122 gross tons; 415 (bp) feet long; 49 feet wide. Steam triple expansion engines, twin screw. Service speed 15 knots. 1,625 passengers (50 first class, 75 second class, 1,500 third class).One funnel and two masts.